It has been wonderful having this student in my class throughout the year. She is always dedicated and works hard on all of her assignments, and she is willing to work with any of her peers as well. I have enjoyed watching her come out of her shell little by little, and her personality is truly a positive addition to our classroom. She is always reading, writing, and pushing herself to do her best. Keep up the great work! This student is a kind-hearted, hard-working, and positive student. Her helpful attitude benefits everyone around her. She approaches every task with her best effort. In class, she actively participates and often shares insightful stories that enhance our discussions. Her reading has improved and her love of reading helps others stay motivated to read as well. She should be truly proud of her accomplishments. This student is a very hard working student in math class. She always comes to class prepared and ready to learn. She is very consistent and grasps math concepts quickly. When working in groups, she helps her team and works to get the job done. Overall, she is a respectful, kind, and hard-working student who is a pleasure to have in class. This student is a reliable student on the team. He’s someone that other 6th graders are drawn to because of his leadership and kind personality. He is very involved at BMS and enjoys helping others. We appreciate his consistency in his academics as well. This student is a thoughtful student who is kind to his peers. He demonstrates STAR behavior in class and works very hard to contribute positively during group work. He has great enthusiasm in class and is always willing to participate. He makes great connections between units and also connects class material to current events. I am so proud of how hard that this student works every single day. He has been a shining example of the expectations that we uphold on team 6-1, and he is a great role model for his peers. He is always willing to help out a classmate, and jumps in whenever someone needs a partner. I am so happy that I have had the pleasure of teaching him this year, as his positive attitude has been a wonderful addition to our classroom. This student is a fabulous example of a student of the month. His enthusiasm for every task is contagious. During class discussions, he is the first to have his hand up, ready to contribute thoughtful comments. I truly appreciate his kindness toward others and me. Overall, he has shown tremendous growth in reading and writing this year through his perseverance and hard work. Way to go! This student consistently demonstrates STAR expectations for the team and has a very positive attitude. She works hard in her academics and advocates for her learning by asking good questions. She also helps her fellow classmates in need if they need guidance. This student has become a leader in class. She demonstrates all of our STAR expectations. She is an excellent peer role model and has become quite helpful to her teachers. She volunteers to read aloud in class and is interested in setting goals and constantly improving. She is curious and asks thoughtful questions. Perhaps most importantly she comes to school each day with a positive attitude ready to learn. This student is always hard working and has a positive attitude at all times. Throughout his classes he has shown his ability to focus and has a clear drive to do his best. We are so proud of how dedicated and hardworking he is, and he is truly a great example for his peers. This student has shown significant growth in reading since the beginning of the year. He has made a conscious effort to read more and focus on raising his fluency and comprehension. In class, he participates by asking insightful questions and comments during our discussions. He is polite and respectful to his peers and me. I am proud of his growth and am looking forward to seeing him succeed in the future. This student is a pleasure to have in class because she works hard at her academics and is kind and respectful to her peers. While a soft spoken person, this student also makes an effort to participate in class discussions and challenges herself regularly to be the best she can be. This student is always ready, respectful, and safe. She always has a smile on her face, is kind to her peers, and is always willing to help her teachers. She is always ready for a challenge academically and strives to do her best work. She does not hesitate to ask for help when needed and she is always willing to contribute to her group in class. It is a pleasure to see her walk into the classroom each day and she always says goodbye at the end of class. This student is a wonderful addition to our classroom, always working hard and participating in all activities that we do. Recently she has also been a shining star in our stations, working extremely hard, sharing out her ideas, and keeping the rest of her group motivated and on task. It is wonderful to have her in class! This student is an outstanding student and person. Her friendly and caring demeanor makes our classroom a better place. Her enthusiasm and love of learning is contagious. A love of reading and positive attitude inspires everyone around her. I feel very lucky to have her in my 7/8 ELA block. It has been a pleasure getting to know her and talk about books with her this year. This student is a very hard working student in math class. He always comes to class prepared and ready to learn. He is very consistent and grasps math concepts quickly. When working in groups, he helps his team and works to get the job done. Overall, he is a respectful, kind, and hard-working student who is a pleasure to have in class. This student is a very positive presence within our classroom. She is supportive of her peers and consistently works hard in her academics. While a soft spoken person, this student also makes an effort to participate in class discussions and challenges herself regularly to be the best she can be. He is always ready to help the teacher. He is a positive role model for his peers and constantly makes good choices. He comes to class with a positive attitude, enthusiasm, and is always ready to learn. This student is always prepared for class and is ready to jump into any activity that we are doing. He is extremely hardworking, and his positive influence is a great addition to our classroom. He is able to work with all of his peers, and is always willing to share out his ideas for class discussion. This student is a hard worker who takes school seriously. In class, she pays attention and always give 100% effort. She is kind to her peers and often offers to help others when needed. 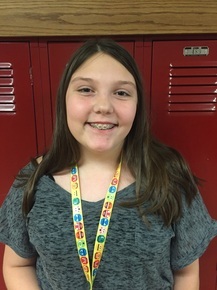 Throughout the school year, she has continued to be an avid reader and writer. She is a model student, and overall wonderful girl. This student is very good about completing her work in class and very responsible about turning in her homework. She follows directions the first time they are given. She works well with other students and she is usually very respectful of other students. Generally, she is a pleasure to have in class. This student is a role model in class that is eager to learn. He contributes to class discussions in a positive way and demonstrates STAR expectations on a daily basis. He cares about our school and we appreciate having him in class! This student is always a ready and respectful student. He comes to class each day ready to learn and always curious. He is helpful and kind to his peers and helps brighten the classroom with his wonderful sense of humor. What a joy this student is to have in class! She comes into the classroom every day with a smile on her face, ready to go. Her kind and compassionate nature allows her to easily work with any of her peers, and she is a great role model for the class. I love having her positive energy in our class each and every day! This student is a strong and conscientious student. In reading class, he willingly participates in discussions with insightful comments and questions. He has consistently worked hard throughout the year to increase his comprehension. His peers look to him for positive leadership. He truly is a pleasure to have in class. This student is a very hard working student in math class. He always comes to class prepared and ready to learn. He is tremendous thinker who loves to share his thoughts on his work and his unique perspective. When working in groups, he helps his team and works to get the job done. Overall, he is a respectful, kind, and hard-working student who is a pleasure to have in class. This student has tremendous work ethic and is very dedicated. She consistently works hard in class and puts forth her best effort. Her peers respect this attribute and follow her example frequently. As a skilled musician, she is also dedicated to the Jazz Band. She is always ready and respectful. She works extremely hard in small group activities and is always supportive of her peers. She always comes to class with a positive attitude and is a calming presence in class. This student is a delight to have in class. She always comes to class with a positive attitude and is ready to work. She is a positive role model for her peers, and is willing and able to work with anyone in class. She is one of the first to share out her ideas in both small group and whole class discussions, and I love her thoughtful additions to whatever activity we are doing in class. We are so lucky to have her on Team 6-1! This student is always ready, responsible, and safe in class. He is a role model for his peers, works hard each day, and is always willing to help his classmates. This student is a bright light on Team 6-1. She is always smiling and comes to class ready to learn. In class discussions, she is the first to raise her hand and offer thoughtful and insightful comments. Her empathetic and caring nature are truly an asset to our positive classroom culture. She also shares her love of reading with everyone around her. She is truly a pleasure to have in class. Mr. Long nominated this student for student of the month for her work ethic, leadership qualities and involvement here at school. Alexandria consistently works at a high level in Science and demonstrates leadership when working with her peers. She also was involved in the Cinderella production. This student has a fantastic attitude and she keeps working until she gets the correct answer. She doesn’t give up. She is always ready to learn. She is very organized and she completes all of her work in class and at home. She works very well with other students and she participates in class appropriately. ﻿This student is always ready in class. She is one of the first students to come in to the room and get started on the Brain. She is always willing to help her peers and is always very patient. She always does her best work on each task in class. She is also very kind. This student is hard-working, responsible, and helpful. It is wonderful to have him in class, as he is always willing to help out, and is able to work with everyone. He works hard to do his best, and his hard work has shown through his writing and reading. He is also willing to participate and share his ideas with the class at any time. This student is one of the most responsible students in ELA class. He always comes to class prepared and ready to learn. He is a voracious reader who loves to share his thoughts on his book. During class discussions, he is a deep thinker and often motivates others to think differently on topics. Overall, he is a respectful, kind, and hard-working student who is a pleasure to have in class. This student has a fantastic attitude and she is always ready to learn. She is very organized and she completes all of her work. She participates in class and he is very helpful for other students. Mr. Long nominated this student for student of the month. He is a role model in class and helps his fellow classmates without being told. He also demonstrates STAR expectations on a consistent basis and has a positive attitude. This student is always ready for class. He comes into class each day prepared with all of his materials and is ready for direction and gets right to the task at hand. He is willing to participate in class in a respectful manner is helpful to his classmates. Mrs. DeMuth nominated this student for student of the month. Her positive attitude and hardworking spirit is a welcome addition to class. She always comes to class prepared, and she is willing to help out her peers whenever needed. Keep up the great work! ﻿Mr. Long nominated this student for student of the month. He is a hard working student that pays close attention to learning activities. He is a classroom leader that adds many positive contributions and consistently demonstrates a positive attitude. Mr. Baker nominated this student for student of the month. She has a fantastic attitude and she is always ready to learn. She is very organized and she completes all of her work. Ms. Zabel nominated this student for student of the month. She always comes to class with a friendly smile and enthusiastic attitude. She did a great job asking questions during our author Skype session. She is a strong role model for others as well!